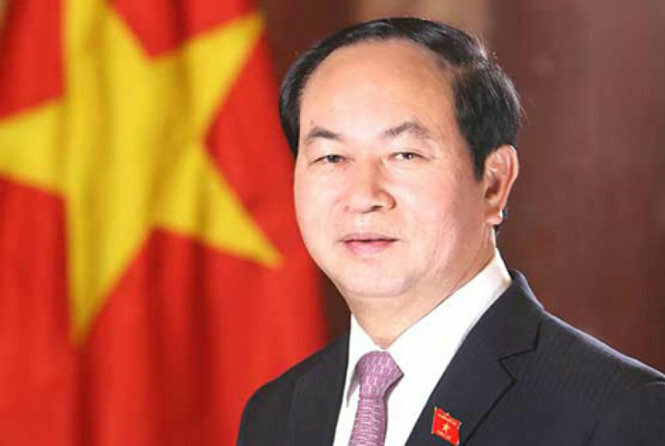 Editor’s note: State President Tran Dai Quang addresses the APEC summit and its vision as chair of the 25th APEC Economic Leaders' Meeting, when the event is taking place in Da Nang, located in central Vietnam. Twenty eight years ago, the Asia-Pacific Economic Cooperation (APEC) forum came into being. Ever since, APEC has been growing vigorously, living up to the role as the region’s premier economic forum. In a globalized and changing world and a dynamic Asia-Pacific, APEC is facing both new opportunities and challenges. As the host of APEC 2017, it is Vietnam's mandate to work with other member economies to transform the APEC Economic Leaders’ commitments into tangible results and bring APEC closer to the people and business community, thereby realizing the strategic vision for an Asia-Pacific of sustainable and inclusive development in the 21st century. The birth of APEC in 1989 took place at a time when the world was undergoing profound changes, opening a new chapter in the history of economic cooperation in Asia-Pacific, transforming the region from a divided one into an increasingly interconnected market toward the common goals of raising the people's living standard and increasing prosperity. On the basis of cooperation characterized by consensus, voluntarism, mutual benefit and mutual respect, APEC is a meaningful cooperation forum for member economies to strengthen dialogue and understanding, thus making important contribution to peace, stability and development in Asia-Pacific. Therefore, for the member economies, developed or developing, Asia-Pacific and APEC are always a top priority in their global strategy. Despite global economic turbulences, APEC has continued to prove its vitality and resilience as well as its role as a key driver of global economic growth and integration. Such vitality does not only stem from its wealth of young labor force and rich natural resources. More importantly, it is the political determination and efforts that every member economy itself has exerted to promote innovation and reforms. These achievements along with APEC's progress in trade and investment liberalization, especially the realization of the Bogor Goals, have upheld APEC's role as the premier regional economic forum, contributing nearly 60 percent and 50 percent of global GDP and trade respectively. APEC has also proven its pioneering role as an incubator of ideas and a coordinator of regional economic linkages. A number of major economic integration arrangements have originated from APEC and its member economies. The Trans-Pacific Partnership (TPP) and the Regional Comprehensive Economic Partnership (RCEP) are vivid examples. APEC members have also embarked on the road to implement connectivity blueprints, facilitating business travelers and promoting investment for infrastructure development, among many others. APEC economic integration, therefore, has increasingly deepened, having made more meaningful contribution to the reinforcement of the values and relevance of the multilateral trading system. Through its three decades of inception and development, APEC has step by step proved its indispensable role in the global economic architecture. Together with other multilateral cooperation mechanisms including the ASEAN Community, bilateral and multilateral free trade agreements, connectivity initiatives, and global value and supply chains, APEC will continue to make great contribution to peace, prosperity and development in the Asia-Pacific region. The course of economic growth and integration in the Asia-Pacific is being presented with opportunities thanks to deepened globalization, the Fourth Industrial Revolution, particularly digital technology, Artificial Intelligence, Internet of Things, among others. The increasing interdependence and connectivity in the region as well as the need to address global challenges also open up new opportunities for member economies to foster cooperation and integration. While regional and global economic recovery is firming, given the international economic integration slowdown, mid-term and long-term risks, rising protectionism, widening development gap and emerging traditional as well as non-traditional security challenges, the regional security and development environment has become ever more uncertain and unpredictable. Against such a backdrop, Vietnam and other member economies are facing challenges in pursuing the mission, values and commitments of APEC. It includes promoting trade and investment liberalization and facilitation, supporting the open multilateral trading system and cooperation on the basis of equality, mutual benefit and respect; exerting greater efforts for an Asia-Pacific of peace, stability and prosperity, in which all people and businesses have equal opportunities to contribute to and enjoy the fruits of economic growth and connectivity. In addition to the aforementioned challenges, there are also new opportunities. Building on its achievements, APEC is now in an excellent position to actively contribute to maintaining the Asia-Pacific’s role as a driver for global economic growth and integration. Key APEC members will continue to be the world’s leading economic, trade and technological centers in the coming decades. With over 150 bilateral and multilateral free trade agreements that APEC members are party to, including efforts toward the eventual establishment of a Free Trade Area of the Asia-Pacific (FTAAP), the region will have vast potentials in terms of market, technology and financial resources. APEC also enjoys favorable conditions to bring into full play its role in a multi-layered international landscape thanks to its flexible, non-binding and voluntary principles, thus enabling member economies to reach a common voice and consensus, even on a number of issues where differences remain. Reality shows that in order to turn challenges into opportunities, APEC member economies must have strong resolve with concrete actions. First, create new dynamism for sustainable, innovative and inclusive growth of APEC member economies. These efforts should be linked with the Fourth Industrial Revolution; equipping the labor force with new skills for work in the digital age; accelerating structural reform; promoting innovation, start-up and business competitiveness, particularly among MSMEs. Member economies should also work hard to build a resilient and inclusive APEC community; promote sustainable urban – rural development, ensure food - water - energy security, reduce disaster risks, enhance women’s economic empowerment and create a better environment for vulnerable groups. These efforts would help increase APEC’s growth quality. Second, promote trade and investment liberalization and strengthen regional connectivity; accelerate Bogor Goals’ achievement by 2020, deepen regional integration and connectivity, and work toward the eventual realization of FTAAP to enhance trade and investment flows in the Asia - Pacific and foster linkages among APEC member economies. It is also necessary for APEC to promote an open, transparent, non-discriminatory and inclusive multilateral trading system. The reality of world trade requires members to enhance cooperation on issues relating to supply chains, value chains, e-commerce, continued capacity building and regulatory coherence. This is the pre-requisite for the forum to continue its role as the driver of economic integration in the multi-layered global landscape. Third, contribute to consolidating APEC’s pioneering role in global economic governance and in tackling common challenges; raising APEC’s adaptability to the changing environment and its leadership in advancing reform, innovation; and increasing APEC’s cooperation efficiency to generate tangible benefits for the people and businesses in the region. APEC also needs to contribute to the active implementation of global commitments, particularly the 2030 Agenda for Sustainable Development and the Paris Agreement on Climate Change. Fourth, to prepare for APEC’s 4th decade of development, we need to discuss the steps taken to develop the post-2020 strategic vision for the forum. This vision needs to further uphold APEC’s leading role in promoting integration, connectivity, sustainable and inclusive quality growth, restructuring, Internet/digital economy, education, quality human resources development, reduced development gap, etc. This is also the development needs of member economies and the common trend of international cooperation in the 21st century. Fully aware of the importance of the close relations between Vietnam and APEC, Vietnam has always made active and responsible contributions to the work of the forum over the past 20 years. Entering the phase of comprehensive reforms, by hosting APEC 2017, Vietnam wishes to reaffirm its foreign policy of diversification, multilateralization of international relations and intensive international integration; being a reliable friend and partner of the international community. We will continue to work with other APEC member economies in building a peaceful, stable, dynamic, interconnected and prosperous Asia-Pacific community.